Insights on health, nutrition, diabetes and hormones: Is Kava Safe? Kava has been promoted as a natural herbal supplement to relieve anxiety and help with mood and sleep. But is Kava really effective for these problems? Is Kava safe? The scientific name of Kava is Piper methysticum. Kava is a plant native to the South Pacific. Like all dietary supplements or nutraceuticals or herbal products, a lot of money is made from their sale. That includes kava. This also means that those many companies promoting or selling kava would like you to believe that kava works great and is perfectly safe. But is kava safe or effective? New evidence is in. Kava might be effective but the data and studies to suggest this are very limited. The chemicals in kava that may reduce anxiety are called kavalactones. 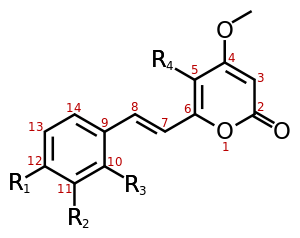 The chemical structure is shown below. Only kava preparations that have a high concentration of kavalactones seem to be effective in some studies. One fairly recent trial that showed benefit was only 3 weeks long. Clearly more placebo-controlled, randomized clinical trials would need to be done to prove effectiveness of kava. Outside of effectiveness, there is now no question that some formulations of kava can cause liver damage or liver failure. And other side effects can occur such as headache, dizziness, and stomach upset. Kava has are over 200 varieties called cultivars. 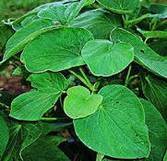 It appears that some cultivars of kava are safer from a liver standpoint than cultivars. And some parts of the plant are best not used to prepare kava extract. It is thought that the likelihood of liver injury may be less likely if the intake of kavalactones is kept below 250 milligrams per day. But this remains to be clearly proven in clinical trials. Many questions remain about kava and liver damage. And I am not sure I would want to volunteer for one of those clinical trials with kava. There are definitely safer approaches to treat depression or anxiety. I would be anxious just worrying about my liver if I were taking kava. And several countries have banned or restricted sale of kava products. In fact, 10 years ago, the FDA issued a consumer advisory for supplements containing kava. But kava supplements are still readily available in many countries including the U.S.. I say avoid kava altogether. When it comes to kava supplements in the U.S., there is no way to know for sure what you are getting in the kava pills you buy. So if you take herbal supplements, read the label before buying or swallowing the pills. Natural does not mean safe. And that includes supplements that come from kava.